The Swiss Federal Railways makes it easy for visitors to travel anywhere in Switzerland with its vast and efficient coverage of the country. Even the remotest villages in the mountains can be accessed through a network of trains and cableways. So it was an easy decision to combine my trip to Lauterbrunnen with Wengen and it turned out to be a good decision. 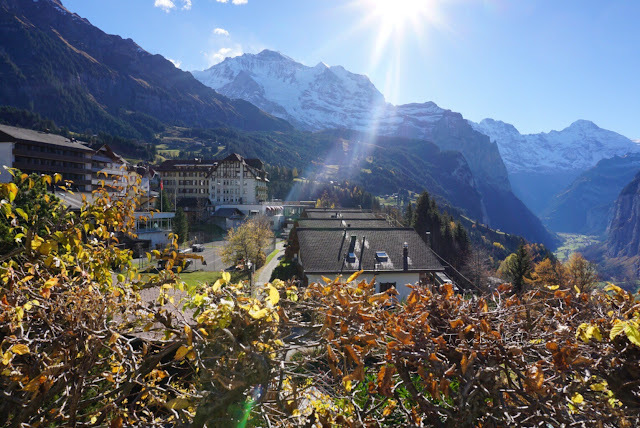 It was warm and sunny in November when I captured this view of the Jungfrau (above). Wengen sits at the foot of the Jungfrau mountain range, 1,274 meters (4,180 ft.) above sea level. It is a quiet, car-free village with less than a couple thousand residents. This count balloons to 10,000 or so during the ski season when the alpine village hosts the annual International Luberhorn Downhill Ski Race. Wengen is the gateway to the Jungfraujoch, Top of Europe at 11,333 ft.